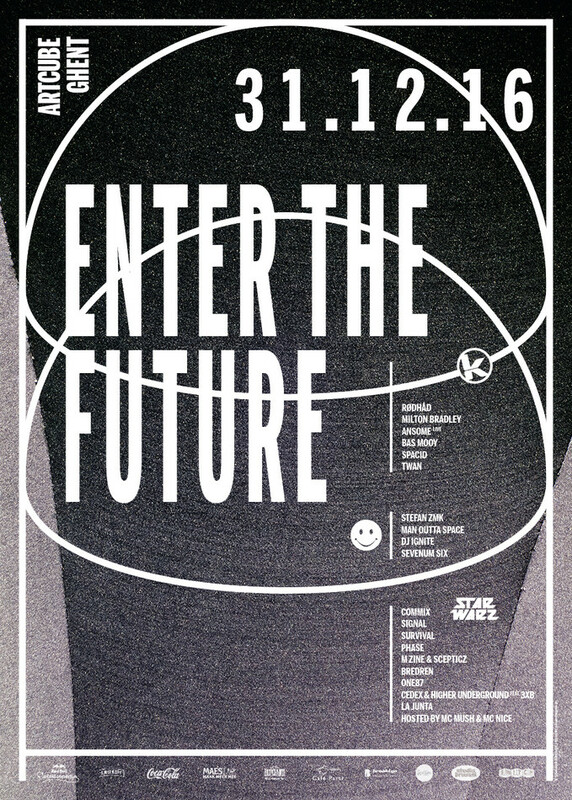 On New Year’s Eve you will be able to ‘Enter the Future’, occupying 3 full blown rooms at the ArtCube venue in Ghent. Those who remember Kozzmozz’ earlier days in ‘t Kuipke in the Citadelpark, know that various concepts used to fly under one flagship. Back then Kozzmozz featured several rooms with different genres and it’s the place where Star Warz was born. For those who don’t remember, don’t worry, we can tell you one thing: it was amazing. Lovers of all kinds of electronic music uniting as one, celebrating like there was no tomorrow. So we’ve decided to do it again, this time celebrating another magical year ahead of us with three party concepts under one roof. A party for all those who love techno but can also appreciate some acid breaks or all those who adore drum ‘n’ bass but don’t mind getting lost on a good slice of techno. It will be a party for everybody who loves experimental and alternative sounds. Because yes, we are going to go quite psychedelic on your dancing asses. Inhale the future, exhale the past, and join us on our trip! The main room is headed by Kozzmozz who will fly you into ‘Space’ as they have been doing so well for over the past 20 years.The commanders leading you into the future are of the highest order and perfectly fit into the philosophy for this New Year’s extravaganza: bringing revolutionary and psychedelic techno sounds for future party generations. If you want to be led further into the ‘Zone’ you may want to go check out the second room hosted by Star Warz, after more than 15 years in the field, still thé leading drum & bass concept in the country and beyond. And for all you lovers of the true underground, the alternative basses and beats .. the real tweeking of the minds, bodies and souls, there will be a third room where you can go find all that your heart and dancing feet desire. Head down to the Retro Acid ‘Area’ if you would like to be taken further into the abyss of the most mind-expanding bleeps with real 303 action! Let’s get lost and step into the Future. Against all leading rules and regulations with beats and breaks that define the future, our future!